A beautiful debut from a late-discovered master songwriter and country music craftsman. I’ve never been a big fan of authenticity arguments. You know, the ones where people debate over whether, for instance, Gillian Welch deserves to play the music she does because she didn’t grow up poor and on a dust bowl farm. To me, the truth is in the sound. The life the artist lived on the way to creating that sound is sometimes relevant, sometimes not. Whether or not the members of Crooked Jades are conservatory-trained musicians doesn’t change the fact when they play a dust bowl ballad, I can taste the dirt. All that said, I can think of no other way to introduce a review of this beautiful record than to play the authenticity card. 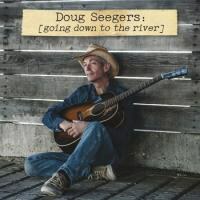 Doug Seegers doesn’t just sing about the hobo life, he has lived it for four decades, squatting in abandoned buildings in Manhattan, sleeping under bridges in Austin and Nashville, hopping trains to another town where the promise of pocket change dropped into his guitar case seemed better. In the 1970s, while performing under the moniker “Duke the Drifter", he formed a short-lived band with Buddy Miller, early in his path to becoming a widely respected songwriter, performer, session player, and producer. Conversely, Seegers’ ensuing decades found him mostly adrift, performing on the streets and battling personal demons and assorted addictions while living on the edge of homelessness. By the turn of this decade, Seeger realized he was running out of time and opportunity to fulfill his dreams of success, so he committed himself to his faith and to sobriety, in the process discovering West Nashville’s Little Pantry That Could, which hosted a weekly singer/songwriter night. It was there that Swedish music star Jill Johnson heard him and committed to recording him. The subsequent recordings of “Angie’s Song” and “Going Down to the River” made Seegers a surprise star in an unlikely place, Scandinavia. Miller, reunited with his old friend on this album, describes Seegers as “part Hank Williams, part Hank Snow, part Gram Parsons". To Miller’s list, I’d add Randy Newman, and not just for some vocal similarities but in particular, Seegers shares Newman’s dry wit and uncanny eye for detail in his songwriting. The raucous, wonderful “Burning a Hole in My Pocket” is a good example, evoking Newman’s “You Can Leave Your Hat On” with its country blues stomp, perfectly-timed, driving horn fills, and the most joyfully libidinous use of the term “jellyroll” in, probably, 70 years. Seegers sings with glee about blowing all of his hard-earned dollars to win the affection of his paramour-of-the-moment as she dances naked across the floor, even boasting that he would “kill a mountain lion and wrestle every bear / just to lie next to you in your underwear.” Seegers even makes good on Miller’s comparison, joining his old friend for a cover of Hank Williams’ “There’ll Be No Teardrops Tonight” and, on another of the album’s highlights, duets with Emmylou Harris to make Gram Parsons’ “She” his own. Producer Will Kimbrough surrounds Seegers with a collection of crack Nashville players, himself supplying guitar and mandolin accompaniment throughout. Lap steel legend, and Parsons accompanist, Al Perkins’ distinctive dobro and pedal steel notes weave into the foundations of most songs here, while Phil Medeira, of Harris’ Red Dirt Boys band, multi-tasks on piano and assorted guitars. Bryan Owings, drummer on numerous Buddy Miller projects, glides from honky tonk bounce to a bottom-of-the-bottle trundle, and Barbara Lamb shines on violin while providing, as well, a rocking banjo for “She’s in a Rock and Roll Band", a parent’s lament for a “little piece of heaven headed straight to hell". Seegers harkens back to the classic country of old while establishing his own unique voice and vision. When Seegers howls, mimicking a train whistle in “Gotta Catch that Train”, he evokes the blue yodels of Jimmie Rodgers. One can hear echoes of Porter Wagoner in “Pour Me", where the singer sits forlornly at the bar while his ex sways across the dance floor with her new beau, “Lucky him, lovely her, pour me.” A less nuanced songwriter would probably reach for the “lucky-lovely-lonely” progression (those Nashville Music Machine songwriters are suckers for alliteration), but Seegers’ choice of the simple, brilliant pun amplifies both his narrator’s state of mind and his means of coping. That’s smart songwriting, and, start to finish, this is one of the best country releases you will hear this year.